Christmas is a season for merriment, feasts and giving. 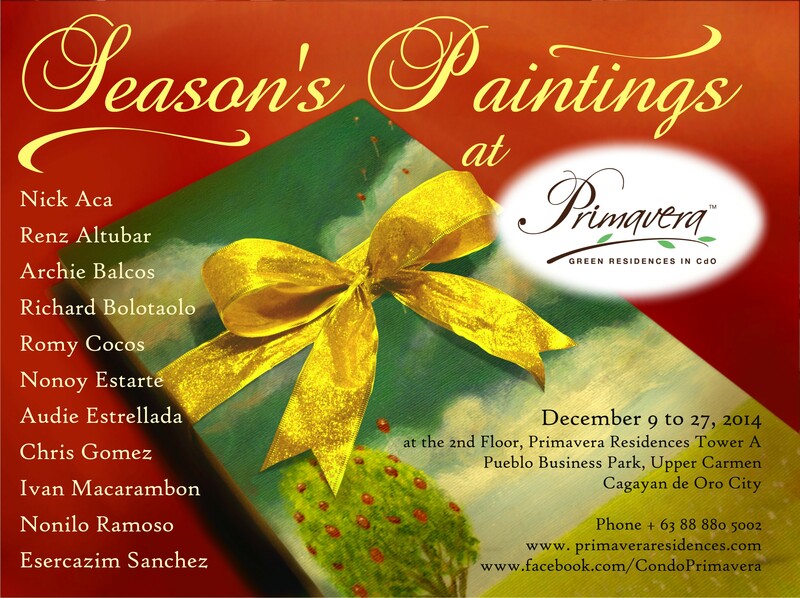 This December 9 to 27, 2014, Primavera offers the gift of art with an exhibit entitled “Season’s Paintings at Primavera.” Viewers will be treated to a feast for the eyes that also warms the heart and nourishes the soul. “Season’s Paintings at Primavera” features the following Cagayanon artists and other artists from other cities of Mindanao who have made Cagayan de Oro their home: Nick Aca, Renz Altubar, Archie Balcos, Richard Bolotaolo, Romy Cocos, Nonoy Estarte, Chris Gomez, Ivan Macarambon and Nonilo Ramoso. To spread the Christmas cheer, two guests artists from other cities were invited: Esercazim Sanchez from Zamboanga City and Audie Estrellada from the island of Siquijor. The exhibition is at the 2nd Floor, Primavera Residences Tower A, Pueblo Business Park, Upper Carmen, Cagayan de Oro. Primavera Residences has previously featured the artworks of Mr. Nick Aca in a month-long exhibit on March this year. As an advocate of authentic Italian elegance and world-class design, Primavera seeks to promote local art through events that promote and showcase the works of Kagay-anon artists. “Seasons’ Paintings at Primavera” will officially open on December 9, 2014 at 5 PM. The event is open to the public. For reservations and inquiries, visit facebook.com/condoprimavera or call 088-880-5002.